For Inca Trail adventures in 2020, we recommend that you reserve in late September 2019 at the VERY latest. The sale of Inca Trail permits for 2020 trips will start the first week in October 2019 and they will sell fast. The trip may sell out before September. Depart any date! Bring your family or group of friends, celebrate your honeymoon or any other occasion. We arrange private trips for individuals, families, clubs and other groups — large or small. Choose any dates that fit your group and we will arrange your trip. All-inclusive! From $2,995 including ground transportation in Perú, quality hotels, all meals, guided tours and first class trekking service. Don't pay more for less! Before making your reservations, compare our adventures and prices with other well known companies. You will find that we offer unsurpassed value without compromising the quality of our trips in any way. Read what our guests say! See our FAQ and the detailed itinerary for complete information and departure dates. Our private adventure begins in Cusco, the archaeological capital of the Americas at an altitude of 11,150 feet. In Cusco you will see massive walls, cobblestone streets and remnants of the Inca Empire and the Spanish colonial period. After a tour of Cusco, and the Sacred Valley of the Incas, we are ready to start our trek on the ancient Inca trail that leads to the legendary lost city of Machu Picchu, an extraordinary adventure into the history of the grand Inca civilization. Along the way, we explore the intriguing ruins of Inca fortresses, and enjoy expansive views from the high passes. 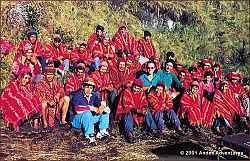 One night we camp in a high meadow, above tree-line, and the next at airy Phuyupatamarca, "town in the clouds." Descending to the Sun Gate and Machu Picchu, the cloud forest trail becomes increasingly lush and varied. After two days exploring Machu Picchu  one of the world's most spectacular ruins ruins — we take a train to Ollantaytambo and complete the entire circuit of the Sacred Valley on our way back to Cusco. 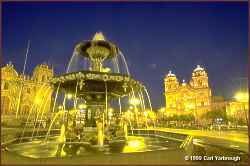 Our adventure concludes with a guided city tour of Lima. Trip extensions to the Amazon rain forest, Lake Titicaca, Ica, Paracas & Nazca Lines and other Peruvian destinations can be added at the beginning and at the end of the trip. 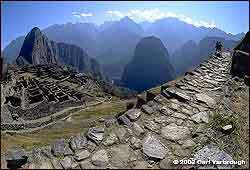 • Depart any date on a Private Inca Trail Trek. • Tour ancient archaeological sites of Cusco and the Sacred Valley. • Hike the Inca Trail - an unforgettable outdoor and cultural adventure. 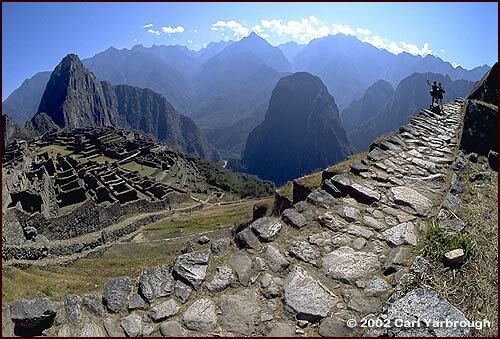 • Experience the view of Machu Picchu from the Gateway of the Sun. • Explore the wonders of Machu Picchu. The Classic Inca Trail Trekking Adventure follows the original pilgrimage trail that leads into the religious capital of the Inca Empire, the legendary “Lost city of the Incas” - Machu Picchu! The trek is moderate to strenuous over mountain terrain at altitudes ranging from 8,000’ to 13,779’. You will explore the archaeological sites that are only seen by those that hike the entire Inca trail. During the 4 day hike you will sleep in 3 comfortable campgrounds. Porters carry all your gear and you only carry a daypack. Some tour operators are offering "Inca Trail" trips that are not on the Inca Trail. Don't accept an inferior alternative. Hike the one and only Inca Trail! Compare our adventures and prices with other well known companies. You will find that we offer unsurpassed value without compromising the quality of our trips in any way.